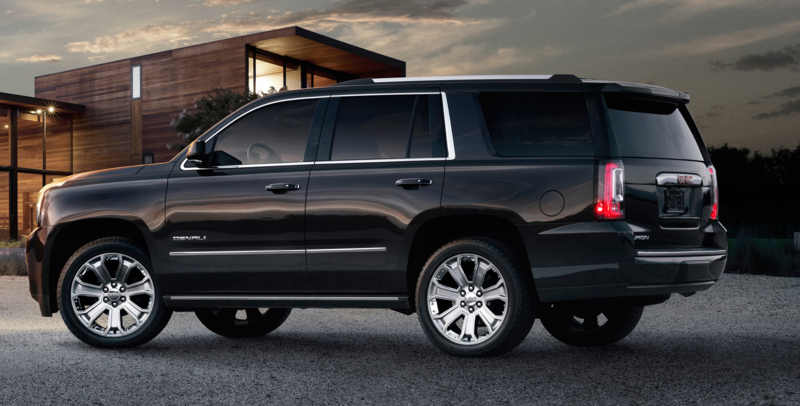 The 2015 Chevrolet Tahoe Review: General Motors has a lot riding on the Chevrolet Tahoe. Along with the Suburban, its longer-wheelbase sibling, it generates tremendous revenue for the corporation’s 103-year-old mainstream brand. Periodically, it gets updated to keep its position as the leading full-size SUV in the market. For 2015, it’s that time again. The new model doesn’t look that different, but every panel has been refined. The most obvious change is the new scalloped headlamps, which curve out and in dramatically. The doors are now inset into the body, rather than curving up into the roof, for a tighter seal, which helps keep things extra quiet. The rear window pillars, being more upright, allow for easier entry and exit for rear seat passengers. The Tahoe is designed for carrying big families or large loads of cargo, and towing your boat to the lake. It’s a very pleasant commuter, too, sailing high and steady above the flow of freeway traffic, but it’s not the most efficient one. Although the highway mileage is up nearly 10 percent over the previous engine, fuel economy, per the EPA, is a modest 16 City, 22 Highway, and 18 Combined for the four-wheel-drive model. I averaged 16.0 mpg. That does beat large SUVs of yesteryear, at least. The Tahoe’s 5.3-liter Ecotec3 V8 engine sends its prodigious 355 horsepower and 383 lb.-ft. of torque through an electronic six-speed automatic. I was surprised at the low the rpm showing on the tach at freeway speeds, just 1500 rpm at 65 mph, which is fuel and sound saving. That V8, the only engine available, receives a Smog rating of 6 from the EPA, along with the Greenhouse Gas score of 4. Interestingly, the V8 shuts down half the cylinders, turning briefly into a four-cylinder, at certain opportune times when the computer decides to save fuel. You can’t really tell, except for the little V4 / V8 display on the instrument panel. The new Tahoe is one of GM’s Flex Fuel vehicles, so it drinks either regular gasoline or E85 ethanol. The latter fuel is not commonly found, but try a tank full if you can get it. The interior is refreshed, and boasts the nicer materials that have proliferated at GM over the last several years. The driver’s seat is surprisingly firm and flat, but feels comfortable in extended driving. There’s a huge console between the front seats that looks like it could hold a week’s luggage. The instrument panel features a full gauge package, something of a rarity these days. There is stylish stitching for looks, but I noticed that some of it on the console was molded plastic. Perfect for long trips, the Tahoe has quick-folding second- and third-row seats. From either the rear side doors or the rear hatch you can pull a lever to drop the seats pronto. This was welcome when stashing my bass, but would do fine after a productive trip to Orchard Supply or Costco. Stepping into the third row is no problem with the relocated rear pillar. Like most popular vehicles, the Tahoe comes in multiple levels, in this case, the typical Chevrolet badges: LS, LT and LTZ. My White Diamond Tricoat LTZ was loaded, and included $6,840 worth of options to boot. These included the “Sun, Entertainment, Destination” package, with power sunroof, MyLink Audio, and a rear-seat entertainment system with a screen that drops down from the tall ceiling. It also had adaptive cruise control, perfect for automatically keeping your distance on those long, monotonous interstate trips. The fancy paint itself cost five bucks short of a grand. The $500 Max Trailering Package makes sense for hauling, and the theft deterrent system keeps curious eyes from making off with your ride. The LS gets cloth seats, but the LT gives you heated leather ones, with more folding and adjustment options. The LTZ heats and cools them, and makes the power folding second and third row standard. The LT and LTZ offer such amenities as keyless entry, a heated steering wheel, and a sliding cover on the cupholders; the LTZ standard, the LT optional. Like the Burger King Whopper, you can have it your way. Cars today are rolling communication and entertainment centers. 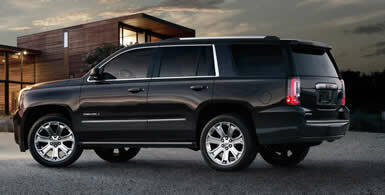 The Tahoe comes with OnStar with 4G LTE and its own built-in Wi-Fi hotspot. The controls are easy to use and the 8-inch screen is large enough to work without squinting or becoming too distracted. Pricing starts at $46,885 for the LS with two-wheel drive. My four-wheel-drive LTZ base-priced at $62,000; with options, the total tab was $69,335.